Update, October 22, 2004: These Techknowman LCDs are out of stock. We do not have a date when more will be available. This $77 package includes a LCD with the backlight pre-installed. An inverter (power supply) for the backlight is included. The inverter requires 12 volts DC. The LCD includes a programmed firmward chip and ribbon cable installed. A pushbutton board and 4 conductor cable are also included, to make a complete package ready to use with the player. An extra polaring film is also provided, which can be installed to invert the appearance of the characters. 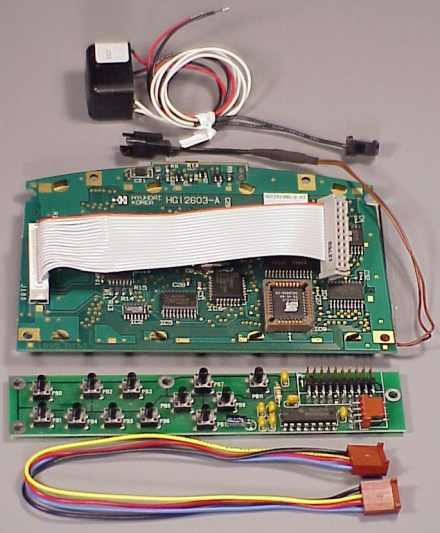 Required assembly involves plugging the ribbon cable into the pushbutton board, connecting the pushbutton board to the mp3 player with the 4 pin cable. 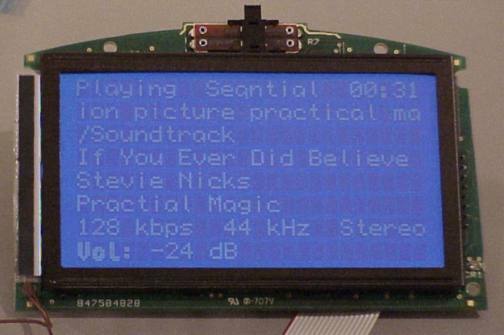 The LCD will operation without power to the backlight, but you will want to connect the backlight for a display that is readable in the dark. The inverter plugs into the LCD, and its two leads must be connected to a 12 volt DC power supply. The ribbon cable connector, 4 pin connectors and inverter connector are polarized to prevent backwards connection.